Have you noticed how many articles, workshops, and refresher courses appear each year addressing issues such as taharas hamishpachah, tefillin, or lashon ha’ra? Yet, somehow, a crucial mitzvah like bikur cholim is, by comparison, infrequently discussed. Dr. Goldberg, a psychologist, the head of Lev Leytzan: the Heart of Therapeutic Clowning, Inc., an organization devoted to bikur cholim, and Rabbi Dinowitz, a mechanech, are eager to take the opportunity to strengthen and inspire others regarding this most precious, holy mitzvah and the refuah brought about by all who are touched by it. They would also like to emphasize the powerful ramifications of this mitzvah, how a visit from a friend can imbue the ill person with increased vitality along with the will to live and carry on. Let’s start off with a couple of crucial, somewhat uncomfortable, facts. There are lonely people. There are forgotten people. Some are young, some are old. Socioeconomic status doesn’t make a difference. Neither does educational level. They could have been your classmate, bunkmate, chavrusa, or the guy who once sat next to you in shul. Illness not only robs people of their physical wellbeing, but far too often devastates their psychological wellbeing as well. We take for granted the thousand daily interactions with friends and loved ones that ground us and provide stability in the face of life’s trials. Illness isolates, it confines, it unravels social ties one by one until the suffering soul loses its very sense of identity. We are all aware of community members who were once active, influential players in our shuls and schools whose lives have since been wrecked by illness. We all know someone in the middle of a long-term stay at the hospital, or someone who is no longer able to get out of the house — people who struggle daily and have all but disappeared from community life. Where are they? Have you looked? Have you inquired? They may be lonely. They may be isolated. They likely crave to be remembered. They are probably desperate to be visited. They want to talk. They want to listen. They want to be seen. They want to interact. They want to matter. They want us! We all know what to do. But then we get busy and we forget. When the thought does cross our mind, we’re quick to make assumptions that other people are taking care of it. All it takes is an evening after work, an hour on a Sunday afternoon. Schedules should not prevent you from reaching out, given the options of social media, texting, WhatsApp, and email. People often anticipate awkwardness or a painful sense of helplessness while performing this mitzvah. Others feel vulnerable, acknowledging how frail man is, how frail I am, you are. This is not an easy mitzvah. But it is an essential one. As far as helplessness—on the contrary, you are healing them. Easing loneliness and isolation can achieve what not even the doctors can do. Bikur cholim is reminding a soul that it’s alive. We have an immense responsibility to these invisible members of our community, the same as any others. No one should be forgotten. Neal C. Goldberg, Ph.D. is a clinical psychologist and the executive director of Lev Leytzan: the Heart of Therapeutic Clowning, Inc. (featured on CNN in 2016). 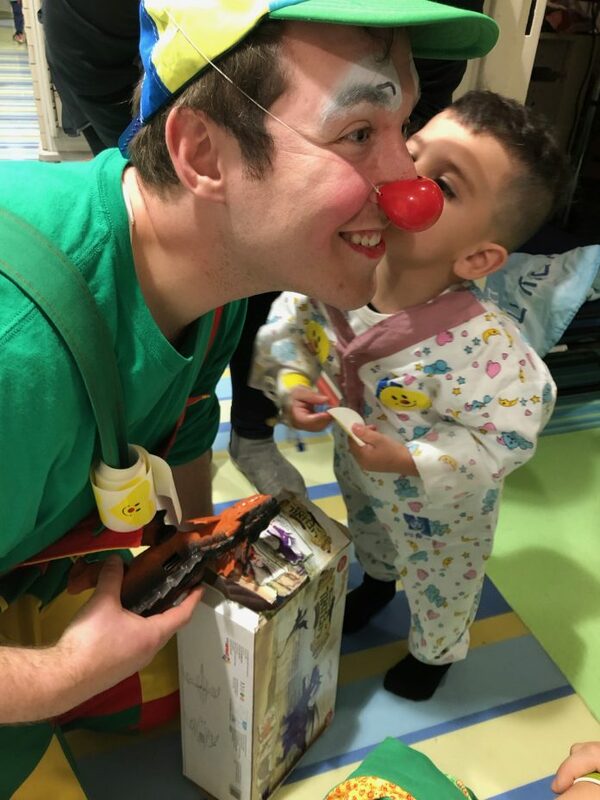 Lev Leytzan is a medical/therapeutic clowning organization, which sends therapeutic clowns to visit children and adults who are homebound or hospitalized with challenging illnesses. Rabbi Nachum Dinowitz is a rebbe at Yeshiva Darchei Torah and principal at Yam HaTorah.